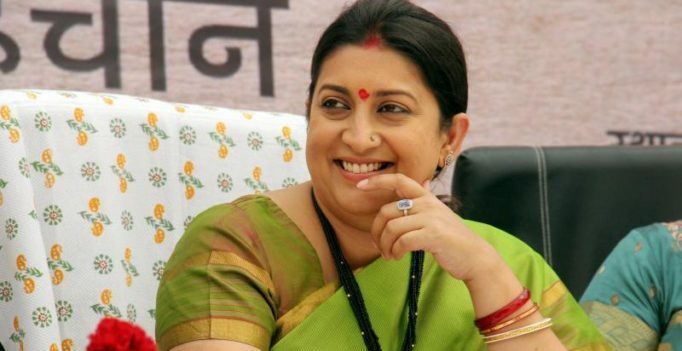 New Delhi: Amid the row over her educational qualification, Union minister Smriti Irani had asked the Delhi University not to disclose it to an RTI applicant, the School of Open Learning has told the Central Information Commission. The Commission has now directed the School of Open Learning (SoL) to produce before it all the records related to educational details of the Union textile minister. A fresh show cause notice has been issued to the Central Public Information Officer of the DU for having failed to produce the records before the Commission as directed. Ms Irani’s degrees have been caught in a row after a petitioner alleged that she had given contradictory information in her affidavits filed before contesting elections in 2004, 2011 and 2014. In her affidavit for April, 2004 Lok Sabha polls, Ms Irani had said she completed her BA in 1996 from DU (School of Correspondence as SoL was then called), whereas in another affidavit of July 11, 2011 to contest Rajya Sabha election from Gujarat, she said her highest educational qualification was B.Com Part I, a petitioner had alleged in a city court. The matter was dismissed by the court on the ground that considerable time had lapsed in filing the complaint. The issue is, however, still alive before the CIC where an applicant had filed an appeal, saying he was not given information about Ms Irani’s educational qualification by the SoL. During a hearing, SoL’s Central Public Information Officer O.P. Tanwar said considering that it was a third party information he had consulted Irani about the disclosure. The petitioner had also asked for photocopies of her hall ticket and mark sheets, besides admission form with enrollment number, in case she enrolled herself for the course but did not obtain the degree. The petitioner sought to know if the Union Minister was enrolled with the University in 2013 why did she not take any examination.